​Eight artists try their hand at collage art in the current TGW Gallery show, with some outstanding results. 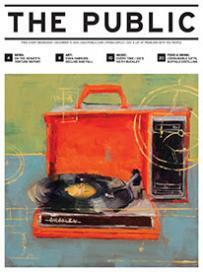 A Musical Interlude: New Paintings by Gary L. Wolfe at Starlight Studio & Art Gallery. Inside the gallery, an excellent exhibit of the sculptor’s wood carvings. Outside the gallery, beavers are at it, too. It’s Halloween and a young Zachary Patton walks into his fifth grade classroom. The Burchfield Penney mounts first ever career overview exhibit of caricature artist Philip Burke. Woman waking up on the wrong side of the bed under a cloud, by Fredrick Mount. Don’t be surprised if you walk in on local photographer Frederick Mount doing something unexpected in your basement. With the help of copious amounts of coffee, experimental filmmaker and sound manipulator Kasumi pored through hundreds of public domain videos.